Dehydrated food is a great way to bring all the food you need on a camping or hiking trip, without the need to bring a cooker – all you’ll really need is a source of water. But one of the best things about dehydrated food is that you can do it yourself and it actually very easy to do.Today, we’ll go through 5 easy and painless steps how to dehydrate chicken, which you can either use for your camping trips or store for about 1 to 2 months for use in the future. You can use canned or fresh chicken, but using fresh chicken is the better option since you can flavor and prepare it the way you want. It’s best to use the breast part of the chicken rather than other parts like the thigh or wing. This is because dark meat has more fat and will spoil a lot faster than the white meat. You can use the basics – salt and pepper. You can also add any other herbs, spices or other flavorings you like. You can use the flavoring to create a brine or a dry rub. Any type of dehydrator will do. Another popular choice of the dehydrator is one from Excalibur. The Excalibur 3926TB is a great choice if you are planning to dehydrate a lot of food. If you don’t have a dehydrator and you aren’t really planning on buying one anytime soon, you can always use your oven. The results are slightly different but you can still get a similar result that you would get with a regular dehydrator. This is if you will be using the oven instead of a dehydrator. A pressure cooker is optional because you can choose to lightly cook your chicken before dehydrating it. But you can always skip this step and dehydrate raw chicken. Once you have all of your tools and ingredients, we can start dehydrating the dehydration process! It is important to cut away all the skin and the fat of the chicken, whether you cooked it first or not. This is because the skin and the fat in the meat will spoil the meat a lot faster. You can cut it into thin strips to make it like chicken jerky or dice it up into small pieces. If you choose to cut it into strips, cut them into strips about ¼ inches thick. A good trick is to have the chicken partially frozen so it will be easier to cut it into thinner strips. If you’re going for cubes, cut about 1-inch cubes. TIP: If you cut the chicken along the grain of the meat, you’ll have a slightly chewier piece of chicken. But if you cut against the grain, you’ll have “crispier” pieces that will break easier into small pieces, so it depends on what you want. The first thing you can do is to season your chicken. In a way, this is optional if you just want plain chicken or if you are planning to mix your dehydrated chicken in other recipes. A great tip is to make a brine for your chicken and to leave it there for half a day to one day so it can really soak up the flavor. You can also just do a simple dry run with some herbs you like, but don’t overdo it. If you want your dehydrated chicken to be more like jerky, you can check out this great chicken jerky recipe from The Yankee Kitchen Ninja. Not everyone does this step when preparing dehydrated chicken so it is really up to you if you want to do it. The benefit of cooking your chicken first is that it will seal in the flavor of your brine, and your chicken will already be almost cooked when it is dehydrated. This way, when you’re out on your trail, you won’t have to worry too much about undercooking the chicken. Cook it in your pressure cooker for about 8 to 12 minutes. If you don’t have a pressure cooker, you can use a regular pan. Just seal it with the lid. If you have a dehydrator, the next step is to lay the pieces on your dehydrator tray evenly. 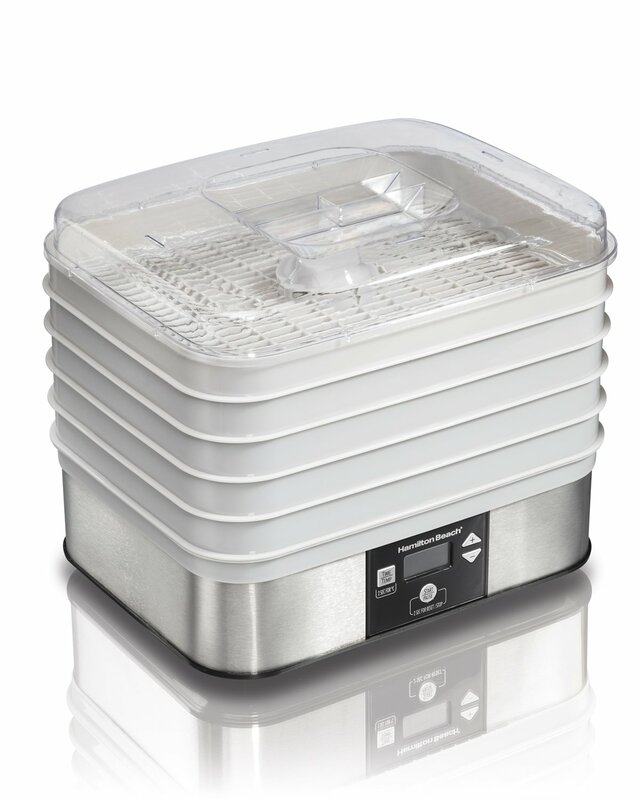 Set the temperature to around 125°F to 155°F, depending on the type of dehydrator you’re using. Just follow the instructions on your dehydrator on how to use it properly so you get the correct results. In general, the time it will take to dehydrate the chicken will take anywhere between 6 to 16 hours, so if you’re dehydrating chicken for your camping trip, be sure to schedule it ahead of time. If you don’t have a dehydrator or you’re not planning on buying one anytime soon, a good alternative is to use your oven. First, lay out your cut up chicken pieces on a pan. If you previously brined it, use paper towels to pat it as dry as possible. Set your oven to the lowest setting, or you can set the temperature anywhere between 122°F to 275°F. The higher the temperature you set the oven, the faster the chicken will dehydrate but it will be less like traditionally dehydrated food. The lower the temperature of your oven, the slower the dehydration process but it will be more dehydrated. Keep the door of your oven slightly open and place a fan in front of the oven door so the air continues to circulate. Remember to check on your chicken every 30 minutes. The whole process will take around 4 to 5 hours depending on the temperature you set your oven. Once you have your dehydrated chicken, all that’s left to do is to store it. If you have a vacuum sealer, that will help extend the shelf life even longer. You can keep it in a jar and store it away for emergency use or for your future camping trips. The dehydrated chicken can last about 1 to 2 months at room temperature, but if you want it to last a bit longer, you can keep it in your fridge. If you’re using it immediately for your camping trip, you can pack it into zipper bags so that it won’t take up too much space in your backpack and will be a lot lighter to carry around. There you have it, 5 simple steps to dehydrate chicken with or without a dehydrator. If you are always going on hiking trips like me, I suggest you invest in a dehydrator. There is a lot to choose from with all kinds of different price ranges so you can find one that suits your budget. 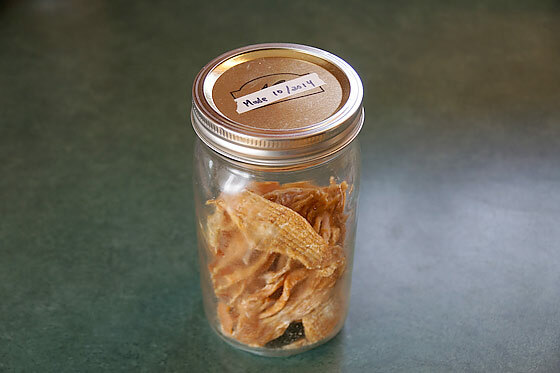 Dehydrated chicken is great to bring with you out on the trail because you can eat it as jerky if you prepared it that way or mix it with your other meals for your camping trip. If you have any questions about this, feel free to ask me in the comments below. Or share this article with any of your hiking buddies who want to learn how to dehydrate chicken as well. Share your new found knowledge and enjoy your next adventure.